Precious metals surged forward Wednesday as oil tumbled. Gold hit its highest point since July while silver and platinum marked heights not seen since September. 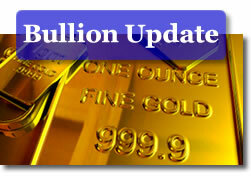 New York silver, gold and platinum futures rose 3.0 percent, 3.3 percent and 4.4 percent, respectively. March crude-oil fell further and for the fourth straight session, declining $1.61, or 4.3 percent. It ended the day at $35.94 a barrel. The average price for regular unleaded gasoline increased 1.2 cents to $1.94 a gallon, according to AAA. March silver gained 39 cents following Tuesday’s 30 cent gain. The metal closed at $13.52 an ounce, the highest since September 26. April platinum surged $45.80 to $1,080.70 an ounce, the highest since September 30. Gold for February jumped $30.10 to end at $943.80 an ounce. Gold’s rally "sparks trending moves to $950 to $955, as well as holding potential for an extreme spike to $980," Ralph Preston, a commodity analyst with Heritage West Futures Inc. in San Diego, was quoted at Bloomberg.com. In spot trading, the London afternoon gold-fixing price — a benchmark for gold traded directly between big institutions — stood at $938.00 an ounce. London silver and platinum were at $13.39 and $1,040.00, respectively. In bullion coin news, the US Mint Gold Uncirculated Eagle 1/10oz Coin Sold Out on Tuesday. The collector coin had a last reported individual sales figure of 8,643, with another 2,862 sold within the uncirculated 4-coin set. Check out CoinNews market resources at Live Bullion Spots, the Silver Coin Calculator, U.S. Mint Collector Bullion Coin Prices, and the US Inflation Calculator.